How do you make a film about the Pitt Rivers and represent the work that goes on behind the scenes of the Museum and the people who make this happen? This was the challenge we faced when we were invited to make a film following the Small Blessings project. Now, seven months ad 50 hours of footage later we are concluding our encounter with the Museum and its staff which is depicted in our film 'Artisans of Memory', from which we have posted clips over the last few months. The idea was to document the stages that objects (in this case, amulets) go through as they circulate through the Museum and its various departments. Each stage – cataloguing, researching, storing, conserving, photographing, displaying – involves particular people, practices and skills and reflects specific experiences and relationships to the Museum and its collections. We approached our film by spending time with the people involved in these stages, as well as those involved in education and interpretation, getting to know what they do, how they work, and how this relates to the overall work of the Museum. Documentary films, especially ethnographic ones, are always an encounter between the filmmakers and their subject(s). We were lucky to have been given privileged access behind-the-scenes and entrusted to document the work of those working here. We were also fortunate to be guided by our producers, Helen Hales and Kate White, as well as other members of staff who helped shape the film. Our relationship with the Museum did not start with this film but some years back when I worked as a lecturer on the visual anthropology MA at Oxford University’s Institute of Social and Cultural Anthropology (ISCA) and every week I walked through the Museum’s door to teach in its seminar rooms. Gradually I got to know some of the people working here and was eventually invited to make a film about a visit by the Haida (a First Nation group from Canada) to the Museum in 2008. This was followed by two further films with Alan Mandel as part of the Body Arts project, one on Tattooing and another on Henna painting, after which we got to know the Museum more intimately. 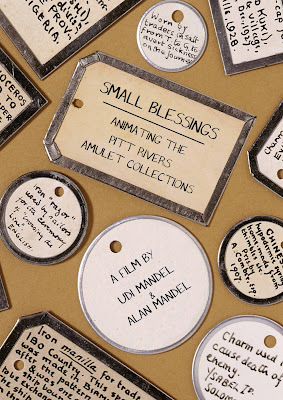 Documentary films are always partial, we do not claim to have made the film which represents all the Pitt Rivers Museum in all its richness, diversity and complexity – an impossible task. Each visitor and staff member no doubt has their own vision of what such a film would be like. What we did do was follow the work of those working here – the ‘artisans of memory’ – through a moment in time, following the stages of the Small Blessings project as a conduit and guide to life in the Pitt Rivers. Given that this project involved the initiation of two new cataloguers, Alice Carr-Archer and Rosanna Blakeley, into the practices and culture of the Museum, the film also takes the viewer on a journey through their learning and experiences as they become more skilled, confident and contemplative in their work. As encounters, films are dialogic - the end result of what emerges through conversations. This is clearly seen in the dialogues in the film, notably the voices of the filmmakers and the questions we asked were edited out. Less obviously this is evident in the quality of the conversation which allowed the dialogue to emerge, the tone and texture of the interaction between filmmakers and subjects. Rare are the people who are entirely at ease appearing on film, especially one that addresses their professional lives. Invariably issues of the personal versus the professional surface along with questions of how to do justice to both. As filmmakers we were interested in both these aspects, in the Museum as site of professional practice and social organization, but also as a place filled with people who care about their work and who bring meaning, emotions, values and identities to what they do. As staff warmed to our presence and the film project, and were less daunted by the tasks involved, both of these qualities were more easily seen. After seven months we have emerged with a film that is a representation of our encounter with the Museum and a number (though not all) of those who work there, partial and dialogic but faithful to our time here. Along the way we had to make some tough editing decisions guided by factors such as film length, a clear narrative thread, and a set of identifiable characters and stories. The film shows the Pitt Rivers Museum as a warehouse of activity, a collection of artisans who care about the multiple and diverse artefacts entrusted to them from numerous cultures across time and space and who are keen to make these come alive, each object and its many stories giving a small glimpse of what it is to be human.